Miniature golf courses in Branson are some of the most chosen spots by young ones and young at heart as they truly give them an exciting and memorable outdoor adventure. If you want to spend a great moment together with the family during summer season, playing at some of several mini-golf courses in Branson is the right choice. Some of the miniature golf attractions that you can find in Branson include waterfall cave, the jungle animals, the Egyptian artifacts, and the smoking dragon. Greatest Adventures Minigolf is one of the most popular mini-golf courses in Branson that gives delight and entertainment for families who want to spend a great bonding moment together. Built in 2008, this mini-golf course is one of the newest and the largest mini-golf courses in Branson. This 36-hole mini-golf course has a beautiful design that offers great fun for visitors of all ages. The fun packed golf adventure at the Greatest Adventures Minigolf takes you to enjoy the beautiful panoramic view of the wildlife and lakes that you would never think you are near the 76 strip and entertainment district in Branson. The convenient location of the Greatest Adventures Minigolf course in Branson allows you to enjoy spectacular views of the Table Rock Lake and Lake Taneycomo that offer plenty of lakeside activities. This awesome mini-golf course features a gift shop that offers themed souvenirs and other unique items. If you are not in the mood of playing golf, you can relax in the snack bar, visit the patio next to the huge waterfall, or watch a flat screen TV program show. If you are staying at some of the best accommodations at Thousand Hills Golf Resort, you made the right decision as the mini-golf course is just around the vicinity of the resort. 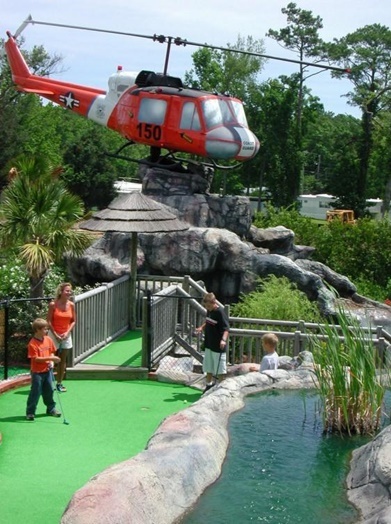 The golf themed attractions at the Greatest Adventure Minigolf are some of the fascinating spots that you can enjoy that include the Medieval Castle, knights, and gorilla. You will also find lots of miniature golf courses in Branson that include the Pirate’s Cove Adventure Golf & Games located at 2901 Green Mountain Drive, Brookside Miniature Golf at 2925 Shepherd of the Hills Expressway, Shoot for the Stars Mini Golf at 3030 W Highway 76, Grand Country Market at 1945 W 76 Country Blvd., Back to the 50s Mini Golf at 2801 West Highway 76, and Indoor Mini Golf at 1945 W 76 Country Blvd. Many of the professional golfers from around the world come to Branson to compete on its spectacular courses. The Greatest Adventures Mini Golf in Branson was rated by USPMGA (US Pro Mini Golf Association) in 2011 as one of the top 10 championship mini golf courses in the USA. If you are a miniature golf enthusiast, Branson has it for you. If you want to play a miniature golf in Branson, don’t miss to visit the Greatest Adventures Minigolf course where you get to enjoy golf themed attractions such as Medieval Castle, waterfall cave, the smoking dragon and many more.